This year, the Artichoke Festival will be held in May in the Monterey Peninsula area at Castroville, Ca. My friend goes every year with her grandmother – imagine that she loves artichokes so much (yes – she’s Italian) – and always has an spectacular time. I finally learned to like them by eating them with a whole lot of other vegetables in an antipasta. I also like Artichokes because they are really healthy and are a significant source of vitamin C, folic acid and magnesium. 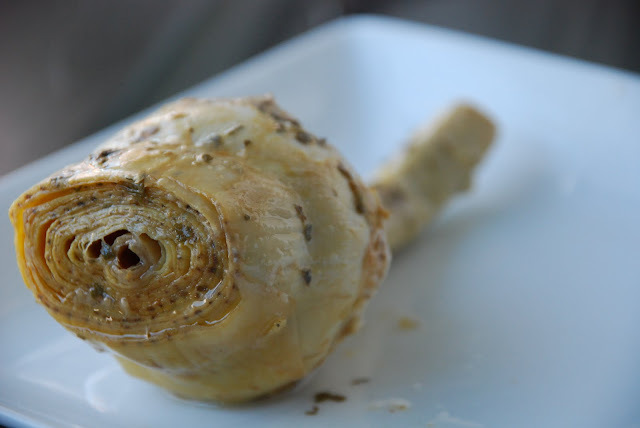 Virtually fat-free, the artichoke weighs in at 25 calories (per medium artichoke) and is very low in sodium. One of the things that I discovered since I started shopping in the Italian markets is that it pays to buy good artichokes. They are a little bit more expensive but there is no match in flavor when compared to the canned ones.